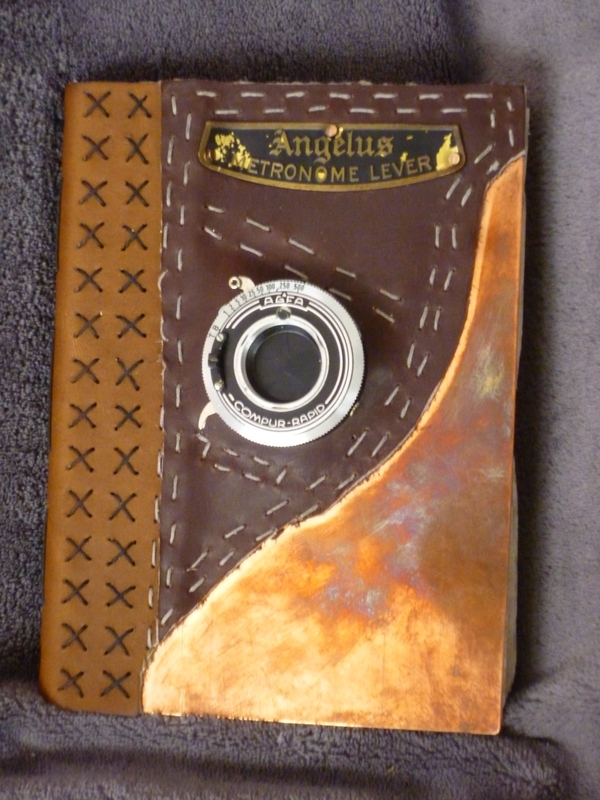 The Metronome Lever Journal was made when Tracy held a class at his studio and invited Trista and I to attend. I had some ideas kicking around for a smaller journal than the Brass Tome. Clocking in at 7″ x 9″ and 9 five-page signatures thick, the Brass Tome is a bear to lug around. My idea was something smaller to carry arround and have the Brass Tome to work in at home or on special occasions. I looked to the paperback books that I love so much (for their portability). The size of a paperback is approximately 4″ x 5″. That seemed a little small to me, by and large not giving me a lot of real estate to draw, create, and write; so I increased the size to 5″ x 7″. With 6 signatures of 3 pages each, it is much more portable. And thus the Metronome Lever Journal was born. While I was trying to come up with some ideas for the cover I kept coming back to these 2 plates and camera lens. The plates were no problem to attach, some rivets and its good to go. The camera lens presented a huge problem in mounting it to the front of the journal. One idea that I had was to sand down a small piece of plywood, drill out a hole large enough to fit the lens, and rivet it to the copper before attaching the leather. That was what I went with as my attachment method, but all of the large-bore bits were either slightly too small or slightly too big. Rather than force it, I decided that it would be better to g too big and then glue it in with gorilla glue. I was a little wary of using glue cause if i messed it up i probably wouldn’t get a second chance and could potentially ruin the lens. but it all worked out fine and the lens looks great. 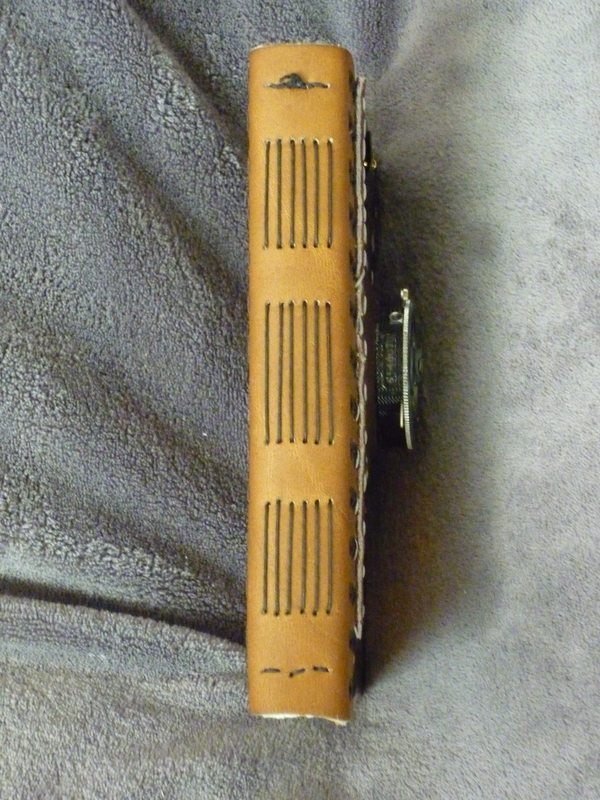 I didn’t do too much to the spine of the Metronome Lever other than the binding. The only concession to anything slightly stylish is how I dealt with melting the knot. After binding the journals signatures together, instead of using a charm, which i have found breaks my knots, I melted the knot down; and while the wax polyester was still hot I mashed the knot down on to the pine plank that I’ve been using as a drilling surface. This gives me what i call a smash knot. It makes a small flat disk and keeps everything bound nicely. Like the back of the Brass Tome, I opted for the use of 2 running stitches with 2 colors of thread. I also then added on the other metronome plate on the back. I was really lucky that I found the cool scars for the back of the journal. For this one I decided that a 6 signature book didn’t need a closure and I think that its given the book a really clean look. The copper was originally polished to a mirrored finish, and I really like how it’s tarnished up as I’ve handled it. 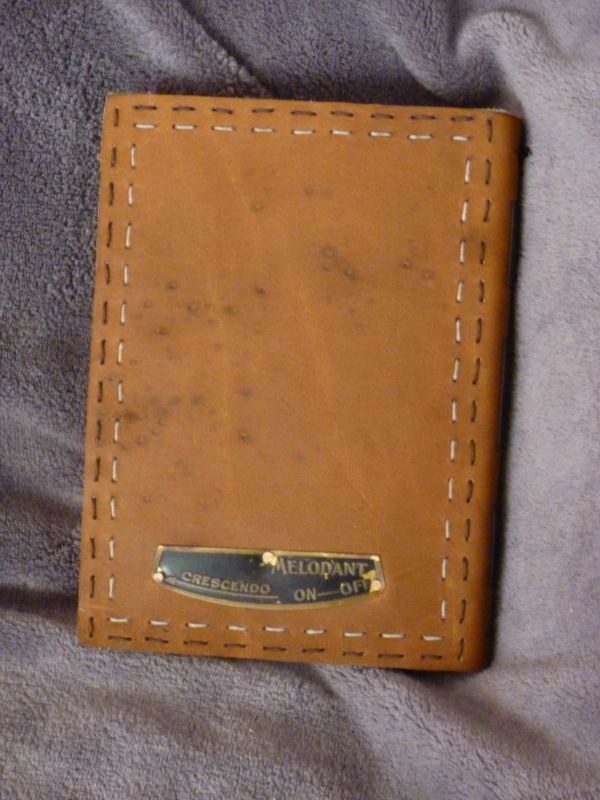 Well that’s the Metronome Leather Journal. Thanks for taking a look at it. Next up is the Leather X’s Journal. This entry was posted on July 24, 2010, 11:10 pm and is filed under Art, Book-binding, Journal-making. You can follow any responses to this entry through RSS 2.0. You can leave a response, or trackback from your own site.